Graphic history 1919 is both a reminder that Canada has a radical legacy to be proud of and a source of inspiration for organizers in our complicated times. 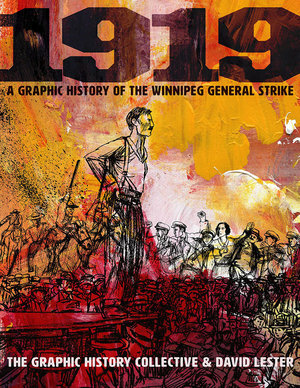 The Winnipeg General Strike celebrates its centenary this year, and Canada's Graphic History Collective has produced a beautiful book to both educate and celebrate this iconic moment in radical and labour history. 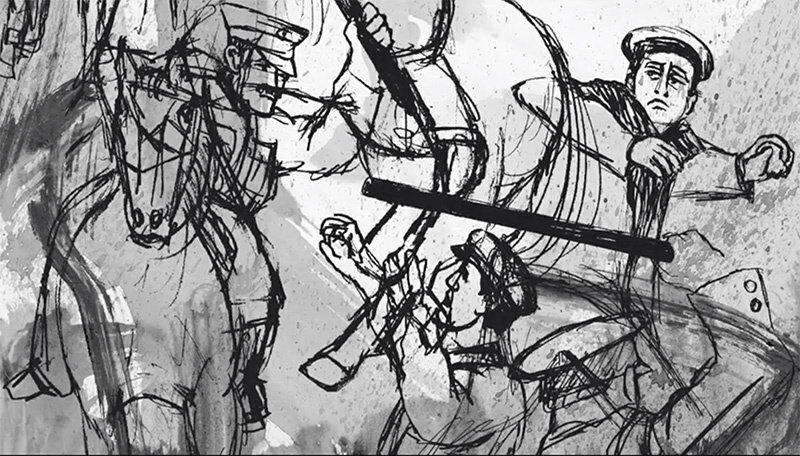 1919: A Graphic History of the Winnipeg General Strike seeks not just to chronicle the events of the strike itself, which ran from 15 May - 25 June 1919, but to locate it in a broader history of class and identity conflict in Canada. The book opens by establishing a sequence of events from the 1885 North-West Resistance – a series of conflicts involving Indigenous and Metis groups resisting the westward colonial expansion of Canada – and the ensuing class and ethnic conflict which marked the development of western Canadian cities like Winnipeg (capital of the present-day province of Manitoba). The completion of the Winnipeg Aqueduct in 1919, for example, continued the expropriation of land and water from the area's Indigenous groups. Meanwhile, growing immigration from Eastern Europe generated additional tensions, which were manipulated by business leaders seeking to curtail labor organizing. The outbreak of World War I and the ensuing conscription of young working class men also generated heightened expectations of improved prospects and living standards when the soldiers returned home after the war. The Winnipeg General Strike exists in a complex genealogy of national and international worker-led uprisings: the Russian Revolution in 1917 and the German Revolution in 1918 both inspired Canadian workers, and large-scale general strikes in both Vancouver and Seattle in 1918 and 1919, respectively, helped organizers understand the incredible potential of large-scale sympathy strikes and general strikes. When it began, it was a logical outgrowth of this tendency toward large-scale, solidaristic organizing and was ostensibly in response to employers' refusals to allow workers in the building and metals trades to collectively bargain by sector as opposed to individual union. In reality, however, it was driven by the confluence of all these tensions: growing income inequality, demands for improved opportunities by returning soldiers, socialist organizing, and Indigenous and poor immigrant resistance against poverty and political marginalization. Women organizers and women labour leagues also played a key role in the strike (which started several hours before schedule when female telephone operators struck first, shutting down the city's communication lines). The subsequent weeks were a maelstrom of militant worker action, not only in Winnipeg but throughout the country, as support strikes erupted from one end of the country to the other. Thousands of newly returned soldiers marched through the streets of Winnipeg in support of the strike, and the entire Winnipeg police force was eventually dismissed because of their overt solidarity with the strikers. The city's elites organized on their part in the infamous 'Citizens' Committee of One Thousand'. They received the quick support of the federal government in Ottawa, whose representatives (including then-Justice Minister and future Prime Minister Arthur Meighen) refused to meet with strike leaders. Instead, business leaders hired and deputized gangs of private thugs who were charged with breaking the strike, backed up by the horses and firepower of the Royal Northwest Mounted Police (precursors of the iconic 'Mounties'). The federal government blamed the strike on Bolshevik immigrants and amended the federal immigration act to render it easier to deport foreign workers. Yet "astoundingly, attempts to turn workers against each other during the strike mostly fell flat," writes James Naylor, a history professor at Brandon University who contributed a historical overview and introduction to the book. "The thousands of non-unionized workers who joined the strike were largely the same immigrants the Citizens' Committee demonized. Also, the returned soldiers seemed to divide along class lines. Large numbers of rank-and-file soldiers stood by their civilian fellow workers on strike. This is what made it a general strike: this was not just an uprising of a minority of workers who had been able to form unions, but a revolt of the city's working class more or less as a whole. Winnipeg workers, whether skilled or unskilled, men or women, immigrant or Canadian-born, rose as one." The action culminated on 21 June 1919, a day which came to be known as 'Bloody Saturday'. In response to a ban on parades, newly returned soldiers organized a 'silent parade' in protest, and the city's mayor issued a warning against participating in the event. 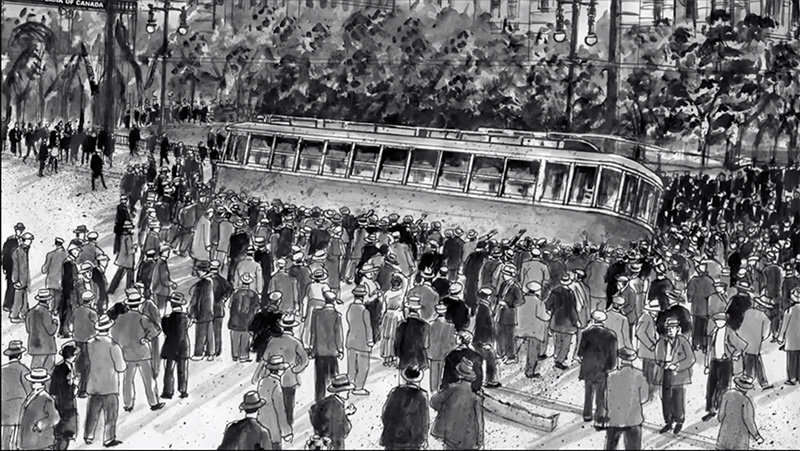 In the early afternoon a streetcar was overturned and set on fire – no one knows whether this was done by strikers or by provocateurs on the government side – and in response government unleashed both the Mounted Police as well as the business community's gangs of private thugs, backed by the Canadian military. Two strikers were killed in the ensuing melee and many more injured. Dozens of strikers and strike leaders were arrested. The Strike Committee called an end to the strike. The discipline and organizing power which precipitated the strike is a clear feature of its centennial celebration, but its legacy is a more complex one. The authors of 1919 point out that it demonstrates the power of a united working class, as well as exposes the naked collusion between the state and wealthy elites which underpins liberal capitalism. Yet ultimately the strike was crushed. Was it due to organizing failures? Should the strike committee have taken advantage of its support amongst police and returned soldiers to adopt a more militant response against its opponents? For a strike which shut down the entire city, it was remarkably restrained, disciplined and peaceful, in contrast to strikes in Russia, Germany and elsewhere that led to armed uprisings against the state. Whatever its lessons, the authors observe that it played a catalytic role in Canada's history of radical and progressive organizing. In the months following the strike, the governing Conservative party was decimated. There was a surge in support for parties such as the Independent Labour Party and the Communist Party, and the Liberals who reaped the major benefit of the Conservatives' defeat conceded some of the labour movement's less radical demands. Several strike leaders ran for office (some of them from jail) and were elected; other strike leaders went on to play a founding role in the Canadian Commonwealth Federation (CCF), a social democratic party which, in 1944, became the first elected social-democratic government in North America when it took power in Saskatchewan (which neighbours Manitoba). The CCF was the precursor to the New Democratic Party (NDP), which today forms Canada's third national party and has won several provincial elections. The authors also trace the militancy of the Winnipeg General Strike through its impression on a sequence of subsequent Canadian strike actions, from the 1972 Quebec General Strike and the Ontario Days of Action strikes in the 1990s, to the Idle No More Indigenous actions of 2012-13. It also, they note, exists in relationship with other mass strike actions in the western world, from the 1984 British Miners' Strike to the anti-World Trade Organization protests in Seattle in 1999. 1919 is the most impressive production yet from the Canadian Graphic History Collective, a group of labour activists, scholars, and graphic writers/artists who have produced other works exploring Canada's radical past and present. Roughly 30 pages – about a quarter of the book -- are devoted to the events on Bloody Saturday alone, comprising a sequence of full-page action art mostly devoid of text. The sketch-like line art conveys the chaotic action of that violent afternoon with dramatic effect. Artist David Lester, in a fascinating commentary on the art at the end of the book, drew on over 100 rough sketches for that sequence: "I did not concern myself about whether the drawings were proportional or even finished," he writes. "They are meant to be in the moment. Unlike the carefully planned drawings in the bulk of 1919, these 'war' drawings are frenzied and crude, and rendered as if in the panic of fleeing as the sound of horse's hooves get closer." He explains how he produced the art with toothbrushes, knives, and watercolour paint "to complete the art with the splatters of dirt, dust, screams, and blood." His artistic aim was, he writes, to produce parallels between different kinds of war, drawing inspiration from the war art of Otto Dix, George Grosz, Kathe Kollwitz, Goya, and others. The book concludes with a photo-essay depicting working-class life in Winnipeg from the period. 1919 also exists in relationship with the cascade of creative and cultural production celebrating a broader anniversary of radical action in the western world. Following closely on the heels of the Russian Revolution's centenary and all the books and art which grappled with that complicated legacy, as well as the 50-year anniversary of the events of May 1968, 1919 is both a reminder that Canada also has a radical legacy to be proud of and a source of inspiration for organizers in the complicated moment which is our present.